Horse Agility is a competitive unmounted equine sport where the horse and handler navigate an obstacle course on the ground. This equestrian sport is growing in popularity and is a great way to have fun and compete with your horse without riding. I want to introduce you to Dawn Westcott and her Exmoor pony stallion “Bear”. 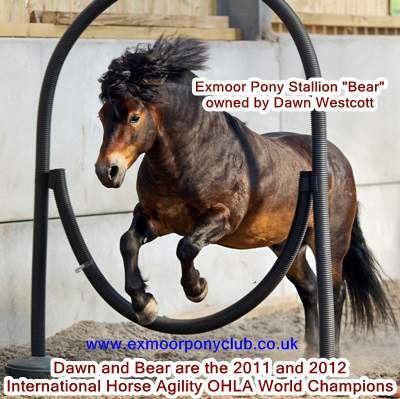 Dawn and Bear are the 2011 and 2012 International Horse Agility OHLA World Champions. Hawkwell Versuvius ‘Bear’ is an Exmoor pony stallion born wild and free on Exmoor. Exmoor ponies are the closest relative to the North West European Prehistoric horse and are known for being highly intelligent, independent thinking and somewhat feisty – having been shaped by Nature rather than man. Bear was difficult to socialize, having also suffered the outdated practice of being multiple hot branded with six large marks, as a newly weaned foal. Dawn is qualified in Monty Roberts methods of horsemanship and a Reiki Master, and she had to look for a deeper connection to make the bond with Bear. He has enjoyed spectacular success in the show ring, winning a National Pony Society Mountain & Moorland Gold Medal, stood Exmoor Pony Society Overall Supreme In Hand Champion twice, and won over 30 county and national championships in the UK. But it took Horse Agility training to achieve the bond with Bear that Dawn was looking for and through their liberty work, Bear is becoming the riding pony she always dreamed of. Dawn’s motivation for competing, rather than just ‘playing’ has been to promote the endangered Exmoor pony breed and show what they can achieve with positive, trust-based handling and training. Bear lives naturally with his mares and foals all year round and is able to put his quality stamp on his progeny, who are also already doing well in the show ring. To find out more about Bear and Dawn visit her website at www.exmoorponyclub.co.uk. Click HERE to see a video of Bear and Dawn’s clips from 2012.